It seems that all kids like pancakes for breakfast. I can’t blame them, a good, fluffy pancake is amazing. I like to jazz up my pancakes every now and again to keep things fresh and exciting. A super easy way to do this is to add fresh fruit to your pancake batter. Our favorite to add is apple. We like to slice it thin and dip it into the pancake batter then toss it onto our griddle. If you do it right you end up with a little ring of pancake and apple, that is fantastic. Otherwise I like to chop the apples into small bite size pieces and mix them in. The heat of the griddle cooks them perfectly. If you are looking for something extra special, try cooking your apples in some butter and brown sugar before mixing them into your batter. Now, I know that apples may not be your thing. What about adding in some black berries? Your kids will get a kick out of the color your pancakes will turn. Or the ever popular blueberry? Okay, so maybe you don’t have time in the morning to whip up a fresh batch of pancakes. It happens. 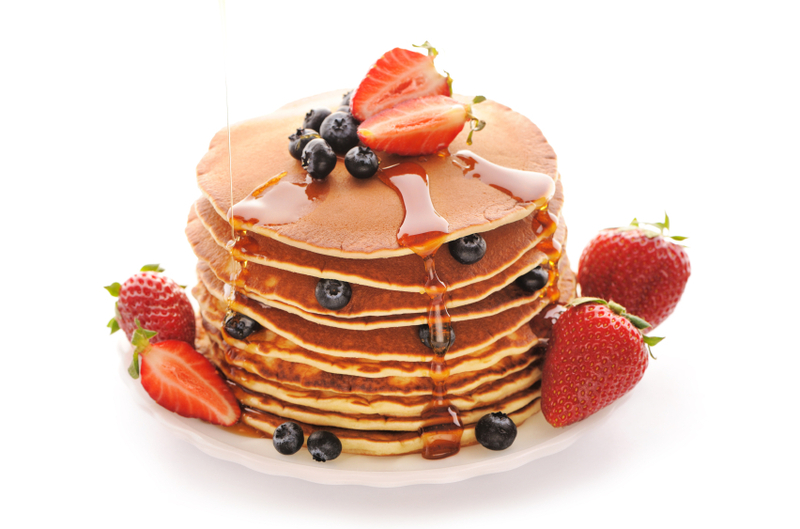 Think about serving your pancakes with fresh fruit and a dollop of whipped cream in stead of the super sugary syrups? You can also live on the wild side like my family and put peanut butter before the syrup. At least this adds some goodness from the peanut butter. Even better if you choose a natural unsweetened variety.